The streak is over, now the focus will strictly be on a repeat. Despite a 23-point effort from Jalen Brunson, it wasn’t enough to hold off No. 18 Butler as the Bulldogs knocked off top-ranked Villanova 66-58 on Wednesday night to snap the Wildcats’ 20-game winning streak. Josh Hart knocked down a jumper to stake the Wildcats to a 52-51 lead with 3:22 left, but the Bulldogs rattled off the next seven points to seize control of the contest. Kethan Savage began the flurry with a layup and capped it with a three-point play for a 58-52 Butler advantage with 1:46 remaining. The Wildcats never got within less than four the rest of the way and the fans in attendance quickly engulfed the floor after the final buzzer. Butler held Villanova’s Josh Hart and Kris Jenkins in check for the most part. Hart netted 13 points on 3-of-11 shooting, but did go 6-of-7 from the foul line, while Jenkins poured in 11 points on 4-of-11 efficiency for the Wildcats, who hadn’t lost since a 69-67 defeat to Seton Hall in the Big East championship game last March. Villanova, of course, went on to win six straight games in the NCAA Tournament to cut down the nets and were victorious over its first 14 contests to start the year. 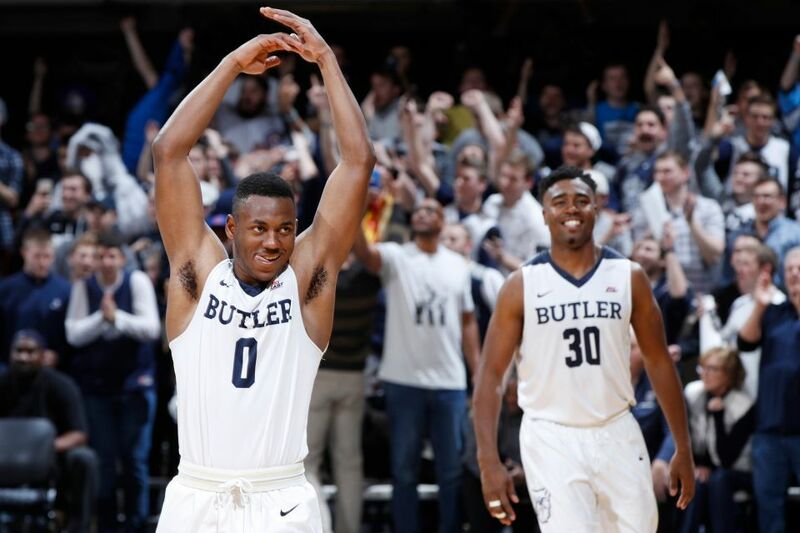 Despite shooting a season-low 37 percent from the floor, the game was a nip-and-tuck affair until Butler pulled away in the final minutes. Baylor and Gonzage are the lone unbeaten teams remaining.